Are you enjoying ISC West 2019 DIYers? We actually missed part of the Resideo booth yesterday, and we're playing catch-up to keep you up to date! We have learned that the Tuxedo Touch Keypad for Honeywell VISTA Systems has received a redesign. The new menus look super sleek and fresh! Most owners of the current Tuxedo Touch Keypad love the device's performance, but they aren't thrilled with the look of the menus. Resideo is seeking to fix that with the Tuxedo Touch redesign. This makeover represents the third generation of Tuxedo Touch Keypads, and we believe that end users will absolutely love the new appearance. The redesigned Tuxedo Touch serves the same purpose as the current model. 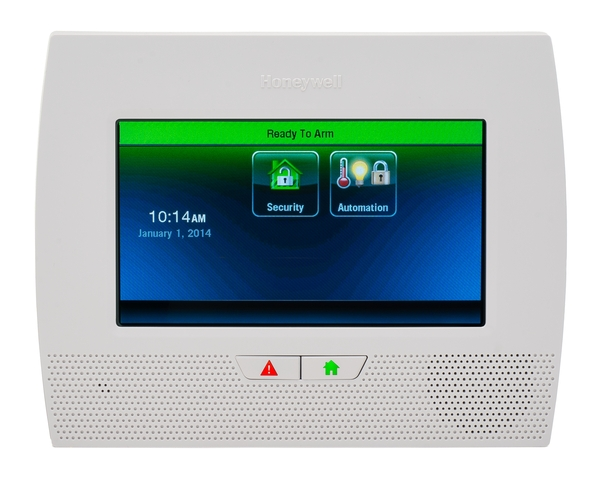 It is a touchscreen keypad that is used to control a Honeywell VISTA System. The keypad wires-in directly with the main control panel to draw power and communicate as needed. By accessing the keypad, user can arm and disarm their system, control individual Z-Wave devices and perform smart automation scenes. We confirmed with Resideo that the updated Tuxedo Touch will support Z-Wave Plus 500 Series technology. Resideo also updated their Honeywell 6280 Touchscreen Keypad. The new model is the Honeywell 6290, and it also offers a fresh new look. The 6290 will be basically the same as the updated Tuxedo Touch, except it won't have Z-Wave functionality. Nevertheless, it should provide a quick and easy access point for VISTA System users. We have also confirmed that a user will be able to enter the IP address for the new Tuxedo Touch and 6290 Keypads into a web browser to control their system as if they were at the keypad itself. Just like the current models, the web browser will need to be on a device that is connected with the same local WIFI network to gain access. A great option if you want to conveniently add an additional keypad is to use the web browser on a tablet and then just mount the tablet to the wall. Both the third generation Tuxedo Touch and 6290 Keypads will use WIFI to connect to a network. Unlike the older models, a hardwired ethernet option will not be available. This shouldn't cause too many issues though, as most users prefer the convenience of a WIFI connection anyway. Thanks for staying with Alarm Grid for the latest ISC West 2019 updates. We will have more posts coming soon! Welcome to ISC West DIYers! We wanted to get our first post up as soon as we had some juicy details. Right now, we're taking a look at the upcoming Resideo Pro SiX Series. The future of Resideo certainly looks bright with their state-of-the-art equipment that will be coming to the market. The all-new Pro SiX Series is headlined by the all-in-one wireless panel, the Resideo Pro Series 7" All-In-One Plus. This panel will support the all new lineup of Pro SiX Series wireless sensors. These encrypted sensors will feature the latest technology, as they do everything the current Resideo SiX Series Sensors can do, and more. Users can expect the new Pro SiX Series Sensors to feature convenient auto-enrollment capabilities, an impressive wireless range and highly advanced security to thwart hacking attempts. Just to be very clear, the Pro SiX Series devices are completely different from the current SiX Series devices. The Pro SiX Series devices will NOT work with the current Lyric Controller. They are being designed exclusively for the new Resideo Pro Series 7" All-In-One Plus. The Resideo Pro Series 7" All-In-One Plus also offers support for up to four partitions. This will be great for users with roommates and businesses that want to section off different areas. Resideo says that the system will feature a completely new user interface that end users should find simpler and cleaner. 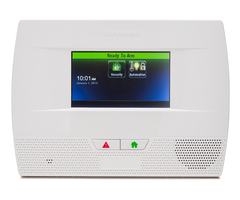 If you are used to working with any of the current Honeywell Wireless Panels, you will find the new Resideo Pro Series 7" All-In-One Plus even easier to use. You may also be excited to know that the system uses Z-Wave Plus technology for home automation. This is a real treat, as the current Lyric Controller only supports classic Z-Wave. End users will surely appreciate the increased battery life and the extended range that comes with Z-Wave Plus and the Resideo Pro Series 7" All-In-One Plus. And with a new system comes all new devices! The Pro SiX Series lineup is diverse and all-inclusive, as it features all the sensors you would expect to find available. Some highlights include a combination smoke and CO detector, an outdoor siren and an indoor motion viewer with night vision capabilities. We would like to give special recognition to the Pro SiX Series life-safety sensors. The biggest news is that they are all one-go-all-go. This means that they all tie in with each other. If one actives, every other Pro SiX Series life-safety sensor on the network will activate as well. If your smoke detector activates, your carbon monoxide detector will also go into alarm. Each of these sensors has an 85 dB sounder for alerting anyone on the premises. And with the outdoor siren being available, you can rest assured that those on the outside will be alerted as well. The indoor motion viewer is also particularly interesting; it's basically a motion sensor with a built-in full-motion video camera. The upcoming device will send 10 second video clips to the end user through Total Connect 2.0. This will be great for confirming a break-in, especially for those in verified response areas. Resideo also says that the video clips will be made available to the central monitoring station so that dispatchers can also confirm an emergency event. And IR night vision is built-in! Another feature is the ability to support up to eight wireless touchscreen keypads. These keypads feature 7-inch touchscreen displays, and they look like an absolute joy to use. This will be great for users in larger homes or businesses who want to access their systems from multiple on-site locations. And having multiple wireless keypads will certainly tie-in nicely with the ability to establish up to four unique partitions. Finally, we asked about the backwards compatibility of the Pro Series 7" All-In-One Plus. According to Resideo, the system will only support the new Pro SiX Series out of the box. However, they promised an add-on module that will allow the system to support the legacy 345 MHz frequency used by the Honeywell 5800 Sensors and the 2GIG 345 MHz Sensors. They also stated that the module will be able to support 319.5 MHz sensors (Qolsys and Interlogix/GE), 433 MHz sensors (legacy DSC) and Bosch Sensors. We will make sure to keep you updated as we learn more about this exciting new lineup from Resideo. Keep checking our blog for more information. Update: We did receive word that the new Pro Series 7" All-In-One Plus will support existing Honeywell SiX Series Sensors. However, any SiX Series Sensor must be deleted from the current system before it can be enrolled with a Resideo Pro Series Panel. This means that you will need to have access to the system's Installer Programming to clear the settings for the sensor. If Lyric Lock is enabled, then you may need to replace your existing sensors. When the SiX Series Sensor is enrolled with the Pro Series 7" All-In-One Plus, a firmware update will be applied to the sensor to make it compatible with the new equipment. Get ready DIYers! We're here to inform you that next week is the International Security Conference & Exhibition West, more commonly known as ISC West. Our content and video teams will be in Las Vegas, NV to cover all the exciting action and the latest news from the security industry! ISC West is the largest converged security industry trade show in the United States. This year's edition runs from Wednesday, April 10th thru Friday April 12th. Our content and video teams will be exploring the massive convention and talking to some of the brightest and sharpest minds in the security industry. We will learn all about the upcoming products and offerings from the industry's leading security and home automation manufacturers - products that you can expect on Alarm Grid soon. And you can be sure that we will keep you posted on all our findings. Expect exclusive pictures, videos, interviews and more, as we bring ISC West directly to you! From Wednesday thru Friday of this week, you can expect multiple posts per day covering our findings at ISC West 2019. You will certainly want to be checking our blog often, as our goal is to get any important news out quickly. And don't worry if you need help or support during this time! Our support and planner teams will still be at Alarm Grid headquarters to provide you with any assistance you need. Remember, the best way to reach Alarm Grid is to email support@alarmgrid.com. If you need to call us, you can do so at (888) 818-7728 from 9am to 8pm EST M-F. Please don't hesitate to reach out to us, as we love supporting our monitored customers! Let's get ready for a great ISC West 2019, and make sure to stay tuned for more updates! We have learned that Version 5.8.5 of the Total Connect 2.0 Mobile App for iOS has a bug that affects WIFI thermostats. The update leaves users unable to control their WIFI thermostats with the mobile app. However, iOS users can still control their WIFI thermostats through the TC2 website. Many users have found that upon updating to the latest version of Total Connect 2.0, they have been left unable to operate their WIFI thermostats through the app. This includes any Honeywell Lyric Round Thermostats and any WIFI thermostat that pairs with TC2 through a Total Connect Comfort, Honeywell Home or Redlink integration. Please note that the bug only affects the iOS version of the Total Connect 2.0 Mobile App. Android users are not affected. Additionally, Z-Wave Thermostats are also unaffected. If you are currently running iOS Mobile App Version 5.8.5, then you can still use the TC2 website to control your WIFI thermostat. You should be able to access the website using the standard web browser on your iPhone or iPad. We expect that Resideo will release an update to fix this bug in the near future. But it may take some time before this happens. Until then, Alarm Grid monitored customers should reach out to support@alarmgrid.com with any questions. Alarm Grid will provide an update when we learn that the bug has been fixed. Just last week, Resideo purchased startup company Buoy Labs. This is the first acquisition from Resideo since the company completed its spin-off from Honeywell in October of last year. The purchase of Buoy Labs should greatly assist Resideo in its technology for environmental sensors. Buoy Labs is best known for its smart home products that allow users to track the amount of water they use and quickly identify leaks. Their lineup fits in perfectly with Resideo. The company already offers many great flood detecting sensors. These include the Honeywell 5800FLOOD and the Honeywell 5821 when used with a Honeywell 470PB Probe or Honeywell FP280 Probe. Many of our monitored customers use these sensors to receive alerts in the event of a water leak. They can then take action before serious water damage occurs. This equipment works great with the wireless panels from Resideo, including the Honeywell Lyric Controller. We believe that this acquisition will help Resideo make fantastic strides in its offering of environmental sensors, particularly for flood sensors. Buoy Labs has an impressive portfolio of smart home water management and water leak detection products. Resideo has cited industry studies claiming that homeowner's insurance companies pay more than $9 billion in water damage claims every year. The average claim is roughly $9,000. With the purchase of Buoy Labs, we expect that Resideo will achieve great success in reducing these figures and preventing house floods. And if you still don't think flood sensors are important, think again. Alarm Grid will certainly keep you up-to-date with the latest news regarding any new environmental or flood sensors released from Resideo. This acquisition means Resideo has some big plans in store, and we are very excited to see what the future holds. Stick with Alarm Grid as we move forward in the exciting worlds of security, property protection and home automation! Hi DIYers! We have learned that Resideo put out a new feature for Total Connect 2.0 in the form of "No Activity Alerts". Users can now receive text and/or email alerts when no system activity occurs after a set period of time. This can be great for making sure that a loved one is active. The No Activity Alert feature represents an ideal method for keeping tabs on a relative or loved one and ensuring that they are moving around and using their system like normal. The feature can be be set to send notifications after every hour, four hours, eight hours, 12 hours or 24 hours. If no system activity occurs after the set period of time, then a notification will be sent to out to any phone number or email address listed as a recipient. Total Connect 2.0 previously made it possible to send out a notification if a specific event did not occur within a set period of time. Users had to create individual notifications for each activity that did not occur. This general No Activity Alert feature is more of a "catch-all" to eliminate the need for setting up a series of notifications. Additionally, this new feature will continue to send out notifications every time the set period passes without activity occurring. For example, if you have the feature set to send alerts after four hours of no activity, you will receive a first notification after four hours of no activity, then a second notification after eight hours of no activity, and so on. Overall, this feature is particularly useful for making sure that loved ones are using their system like they are supposed to. You can set it up for an elderly or disabled user to make sure they haven't fallen down or experienced an injury. It's also great for making sure that your kids or your spouse has returned home safely. If you are an Alarm Grid monitored customer with questions about this new feature, please do not hesitate to reach out to us. You may email us at support@alarmgrid.com, or call us at (888) 818-7728 during our normal business hours of 9am to 8pm EST M-F. We look forward to hearing from you!